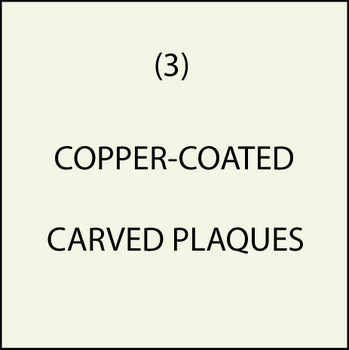 This section shows our copper-coated plaques and signs. Six thousand years ago, copper was the only metal known to man and, thus, was used for all metal applications. It precedes the invention of bronze and brass, both of which utilize copper (bronze is made with a copper-tin alloy, and brass with a copper-zinc alloy). The "Copper Age" began in 4200 BC, over 6 millenia ago. Much later, Romans mined the “metal of Cyprus”, Cuprum. It was used for currency and coinage, decorative art. and was symbolic of Aphrodite/Venus. In the Old Testament, it is stated "Men know how to mine silver and refine gold, to dig iron from the earth and melt copper from stone" (Job 28:1–2). Today copper is used for plumbing pipes, electrical wire and components (high electrical conductivity), lightning rods, ammunition, and for roofs that eventually acquire a green patina. The Statue of Liberty contains 179,220 pounds of copper.Excluding expense and weight, our copper veneers are indistinguishable from solid cast copper. Durable and classically beautiful, our copper coatings possess all the physical properties of solid cast copper yet its composite matrix gives it the added benefit of being anti-corrosive – in other words, even after years of use and exposure to the elements there will be no corrosion, just a beautiful green patina. We coat our HDU and metal plaques and signs with a cold-casting copper metal coating liquid spray (using a spray gun or airbrush). We use a proprietary blend of real copper particles and a binder (similar to epoxy resin for fiberglass) that we cold-spray onto virtually any substrate, including High-Density-Urethane (HDU) (most common), acrylic, aluminum, and steel, to create the look and feel of solid cast copper. Our copper-coated carved plaques use as a substrate 30 lb/ft3 density (about the density of wood) High Density Urethane (i.e., Precision Board from Coastal Enterprises) for improved polishing and extra durability; this has twice the density and strength of HDU that most other sign companies use for their HDU signs, which has a density of only 15 lb/ft3 and less than half the strength.. The copper veneer has a living finish and will age naturally over time, eventually acquiring a verde (green) patina. The copper coating is applied as part of a proprietary seven-step process by our craftsmen. At an average 10-mil thickness (metal electroplating is less than 1-mil thick), our metal-coating process adds less than four ounces of weight per square foot, provides the durability of solid cast copper, and is non-corrosive. Our copper veneer and HDU substrate has a Class 1-Class A fire rating. Metal-coating is expensive because of the cost of the material ($800 to $1000 for a gallon), and the extensive labor required to hand polish and burnish the copper to a shine (as much as 8 hours for a large plaque). Our metal-coated plaques cost $162/ft2 (retail) , compared to our copper metallic painted HDU plaques with a price of $87/ft2 . Our proprietary copper-coated HDU substrate may be used for on both interior and exterior locations. The copper veneer will not chip, flake, bubble, or peel and will last a lifetime. The veneer is impervious to ultraviolet light, non-corrosive, non-conductive of electricity and can withstand a force of 2,300 psi without detaching from the HDU substrate. These copper coatings can be applied with a patina, spot-polished, or high-polished. Samples of these colors and textures are shown in the photos in M7202 . The variations for each material are achieved by the mixture ratios of the coating material and the amount of polishing on different areas .